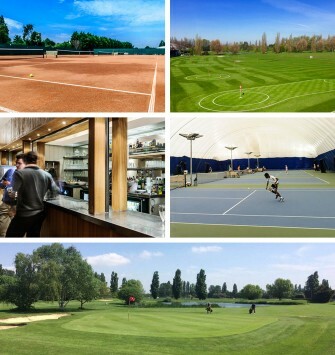 Dukes Meadows Golf, Tennis & Ski is the perfect sports venue for all the family. Pay & Play with NO membership required! Overlooking the River Thames in Chiswick, Dukes Meadows is well located for easy access to and from London and within close proximity to mainline stations. We offer superb facilities including a 9 hole, par 3 golf course, a 50 bay floodlit driving range, academy 5 hole course & short game area, indoor and floodlit outdoor tennis courts, a gym, treatment rooms and an indoor ski slope (Skieasy). Plus a fully refurbished 200 capacity function room and café. Book online up to 48 hours in advance. We have introduced an extended advanced booking service for customers who like to book more than 48 hours in advance. You can register for this service for an annual fee of £60. Once registered you will be able to book up to 7 days in advance for any facility within Dukes Meadows. Additional facilities include onsite parking for 150 cars, a fully licensed bar and a full catering service. Swing into spring with us! New season new sand. We have recently re-shaped and re-turfed our bunkers on the 2nd, 5th, 7th and 8th! Great work from our greenkeepers!